say! what do I need to say other than I'm not purposely ignoring the bloggyhood, I'm so busy these days I just can't keep up! of course, this time of year being out of the blogging loop is a common phenomenon for lots of us. looking at what I have coming up for the next month, I can't see that it's going to get any better, in fact, if anything, my presence in the bloggyhood may get more sketchy and infrequent. but don't take my absence as a sign as anything other than being crazy busy! it's not travel keeping making me scarce, but deadlines for this, that, and some other things. the weekend was particularly packed. we may have finally completed the july birthday celebration marathon. but then again, maybe not, I have a couple friends where we have a tradition of checking out some interesting or new restaurant with the rationalization (excuse) of celebrating our shared summer birthdays. so truth be told, the marathon will be spilling into august or september depending on everyone's schedules. ms t had her 4th birthday party on saturday morning. it was BIG FUN and shared fun. ms t shared her party experience with a girlfriend from her nursery school. the shared party turned out surprisingly well. 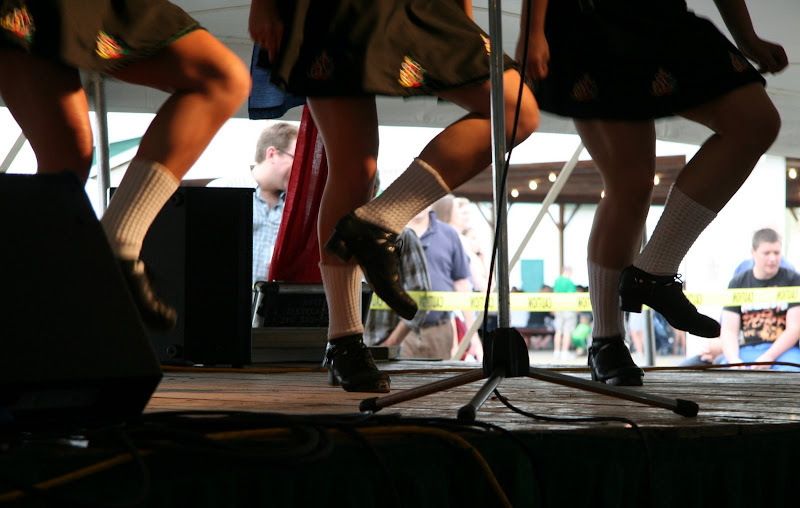 the other big fun going on this weekend was the annual cleveland irish festival. eileen ivers & immigrant soul performed (along with scads of other great musicians in groups and as solos) - I can never get enough of eileen and the boys. this year we were introduced to the kreellers, a group from detroit that I hope will join the ranks of festival regulars. I liken their songs and style as a kind of north american cross between the oysterband and pentangle (minus a fiddle, squeezebox and female vocalist) but with deep celtic roots. well, that's all I have time to say for now. can't promise if I will put up anything else this week other than planning a theme thursday post. I know I have a few snaps that fit this week's theme and it's always fun to play along! simple lyrics packed with some mighty good advice. don't worry about it...summer is a busy time...better to enjoy getting out and doing than hanging about the compooter. See ya when we see ya! 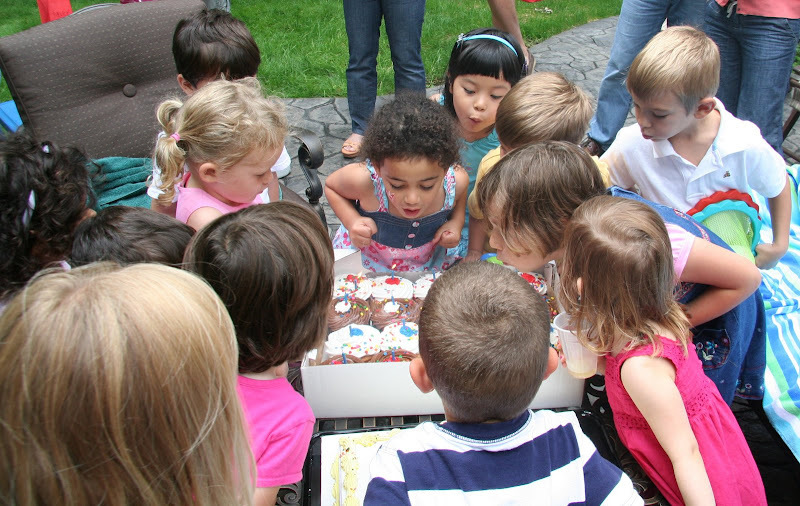 kimy, let's see; big box of cupcakes+a bunch of wee kiddies=frosting and cake, everywhere!LOL! Hey, family first, yes? Enjoy the summer whilst you can, as it seems to get shorter every year! And I just received some old snaps that tie right in to this( but not sure if I can restore them ). Our Irish festival is coming up in Dublin. Always a big deal! Love the group "blow out" there. Priceless! And oh, do I hear ya on the busyness. "You should have seen the river I had to traverse this morning!" Loved the pic of the River dancers. You certainly caught that moment. Belated bon anniversaire to Ms T.
The birthday photo is wonderful - love those clenched fists. Happy birthday to Ms. T! Come and go as you please, friend! The blog world is free space, so you can do whatever you want here. YES! Wow those are some mighty cup cakes! I know the feeling. Spent most of last cold and drizzly Sunday catching up. Love the birthday pic! Hey, we'll all be here when things slow down; summers are busy!